« The Shift of Ages is Upon Us…Finally! For eons of time, the energetic realms around planet Earth have been infested with these ankle biters who have been feeding off of the negative energy generated by humanity’s vast suffering, conflicts, wars, etc, as well as subtly influencing people to continue to perpetrate regressive behavior and produce more of this low-frequency energy. A vast, multi-density effort is underway on this planet to remove this infestation so that humanity can evolve on a more positive path. Part of this effort involves beings known as “Starseeds” or “Wanderers” who had previously completed 3rd density to incarnate on Earth and anchor high-frequency energy into the planet. 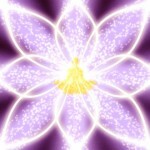 I am one of those starseeds, and my methods center around conducting Galactic Core energy through the physical and energetic bodies into the core of the Earth. This is good for the individual, as well as planet Earth and collective humanity. However, anything and anyone that threatens the ankle-biter dominance of planet earth encounters tremendous resistance from the “dark side.” True to form, the ankle-biters have been messing with me for my entire life, especially in the dream world. They simply do not like my kind on “their” planet, although it is not really their planet any longer. I had a pleasant childhood with loving parents, but the dream world was another story. My mother often worried because I thrashed around in my sleep most nights. The first time I was shot in a dream, I was 8 years old. Some dreams were so intense that I had to will myself to awaken in order to get out of the dream. One night at age 6, before falling asleep, I could see a strange trans-dimensional being hovering above my bed. It was an undulating geometric shape, and I didn’t like the feel of it, so I told it to go away. It left, but the astral parasites continued affecting my dreams throughout my life. One example of a negative dream incursion that occurred in when I was in 2nd grade started like a normal dream of playing in a field at my school that had an ant colony. My friends and I were putting some of the ants in jars to observe them, as we sometimes did in waking life. In the dream, the queen ant came out of the ground, and she was as big as me. She attacked, and I had to kill her to protect myself and my friends. When I woke up, I was very glad it was “just a dream” but I also felt somewhat disturbed by the experience. This type of dream would continue play itself out in various forms for much of my life. At the same time, the rest of my dream-life was very pleasant and enlightening. When I was in 2nd grade, before the queen ant dream, a series of flying and lucid dreams helped me to understand that physical “waking” life was simply a different form of dreaming. In other words, we are dreaming ourselves here in 3rd density, and our true identity is far more vast than we can currently realize. That insight stayed with me my entire life, and has been crucial to my work in the energetic realms. I have also been a very aware / lucid dreamer for most of this life. I still vividly remember the flying dreams I had in second grade, dreams from when I was 20, from 2 years ago, from last night, etc. I don’t always remember every dream, but I do remember many of them, especially intense or highly significant ones. My “technique” for remembering dreams is to simply review the dream when I wake up long enough to roll over and go back to sleep, and that is usually enough to hold the memory. Because of this long-term dream memory, I have been able to see patterns in dreams that most people don’t notice. I don’t write this to brag, but rather to give a small illustration of how I have gleaned information from the dream-time throughout my life, both positive and negative. The negative dream experiences taught me a lot, and they also motivated me to find a way to prevent them from occurring. What I have come to understand over the many years of observing my dreams is that some dreams are not of our own making. Our dreams do NOT always stem from our subconscious desires, because sometimes our subconscious fears are being used against us in order for ankle-biters to feed off of the energy that fearful dream scenarios generate. These “manipulated dreams” will almost always have some element of danger like being pursued by shadowy figures, monsters, zombies, criminal gangs, police, etc. They can also be manifestations of fears, like having a house blown away by the wind, losing a loved one, being stabbed, shot, beaten, robbed, ridiculed, lost in a strange city, attacked by gigantic insects, etc. One commonality through all of these types of “nightmares” is that if a person has control over their dream activity, they will not experience the traumatic scenarios induced in these kinds of dreams. There are MUCH better ways to address subconscious blockages and limitations while asleep and dreaming, and being kidnapped by monsters certainly does nothing to help a person actually resolve their fears. If anything, these kinds of dreams can make such fears more problematic, even if the dream is forgotten after waking. In my waking life, I simply put invasive ankle-biters in containment orbs and send them to the Galactic Core to be transmuted into productive Universal citizens. (The ones too afraid to transmute are held in a compassionately run detention center.) However in the dream world, unless I am fully lucid, I perceive those intrusions as “real life” attempts to, for example, break into my home. When I wake up from such a dream, I can feel that my energy has been unbalanced and drained by the “fight or flight” emotions from these externally imprinted dream scenarios. At the most basic level, the ankle-biters do this to generate and harvest our negative emotional energy. Please read “Never Call Them Archons” for more details about how these creatures operate. Other uses of these dream manipulations are to break up relationships, derail cooperative projects, drain motivation, and generally disrupt a person’s life. This is especially true for healers, lightworkers and people working to make a positive change in the world. If you have ever had 2-3 nights in a row of bad dreams, interrupted sleep patterns and altogether too little sleep, you know how debilitating this can be. Ankle biters know this as well, so they use this tactic to vector a person away from their highest path and into a struggle to simply maintain balance. How they do this is very interesting, and knowing this will help us in our dream-shielding efforts. Essentially, what we consider the “dream-world” is an ankle-biter’s native habitat, so when we go to sleep at night, we are wandering into their territory. The ankle-biters are still heavily infesting the lower 4th density zones around this planet, as well as under the planet’s surface. When we go to sleep and wander into their territory, they are all too happy to “entertain” us with fear-based scenarios, straight out of our subconscious minds, that will generate energy for them to consume. It is kind of like going to a carnival and wandering into a combination of a “house of mirrors” and a “house of horrors” that generates situations based on the contents of our own subconscious fears. The efforts of the Forces of Divine Light have been very successful in reclaiming large amounts of “territory” back from the ankle-biters this year. Currently, the outer grid of the planet is fully controlled by the Light Forces, and the layer beneath it is about 80% cleaned up and “disinfected” of ankle biters. However, the two lower layers beneath that are still pretty infested with darkness, as well as two to three layers under the surface of the planet. Many of these ankle biters were “displaced” by the operation that reclaimed the outer planetary grid for the Light in May 2012, and they are floating around this “lower astral” realm looking for food. This increase in ankle-biter activity in the lower astral realm has been a factor in some people really “losing it” this year in very bizarre ways. The ankle biters are desperately looking for easily exploited humans to use for food. They are also retreating into the subconscious of vulnerable people, and in a sense using the population of Earth as “Human shields” to evade the incoming higher light frequencies. This is a stalling tactic that will hopefully not last much longer. Nonetheless, when we enter the dream realm, we often do so without adequate protection, and this is like wandering into a bad neighborhood alone at night. 1.) Connect to your Higher Self, to the Galactic Core and to the core of the planet. 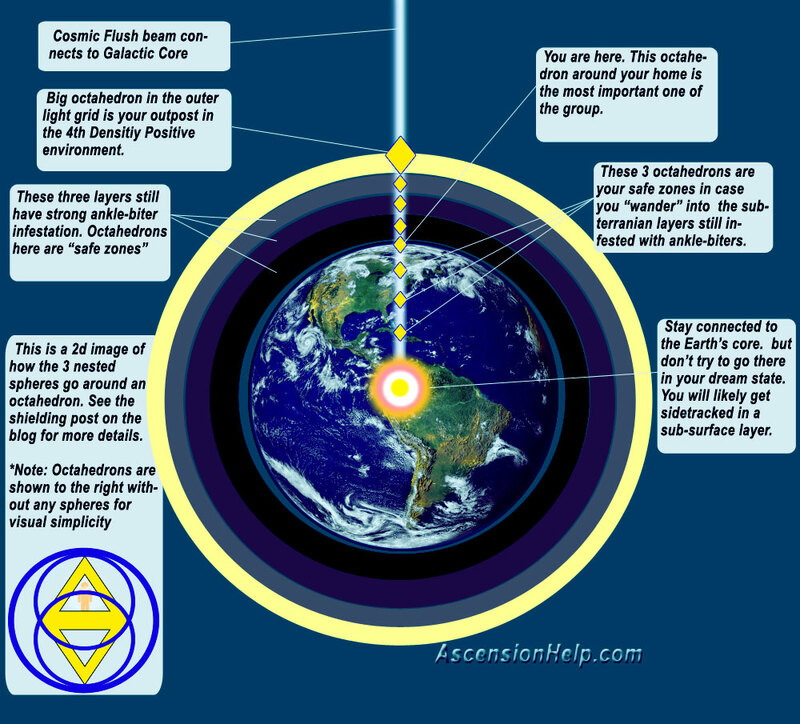 (As taught in the free Level 1 Self Clearing System) Feel free to experiment with connecting to Earth’s core before the Galactic core. 3.) Build a big octahedron around your entire home, then add the shielding spheres. 4.) Build 3 more big octahedrons below you in a line that follows the energetic connection you have to the planetary core, going down to just above the core of the planet. These should be the same size as the one you put around your home. Add shielding spheres to all 3 of them once they are built. These are your safe-zones if you end up going into any subterranean areas while dreaming. 5.) Build 3 more of the same big octahedrons above you extending upward in the sky. These octahedrons will be your safe-zones in the areas above the planet that the ankle biters currently infest. 6.) Build a final, double-sized octahedron in the outer light-grid of the planet. When it is in place, put the 3 sphere shields around all four of the octahedrons in the sky. 7.) Invite in the “Forces of Divine Light” that are of full positive, service to others polarity beings to take up residence in all of these octahedrons, especially the big one from the previous step. Be very clear that you ONLY accept beings that are fully polarized to the positive polarity, and are working towards humanity’s freedom. Ask them to maintain the safe-zone space within your octahedrons. 8.) Ask your Higher Self to keep you within these safe zones during your dreams. Specify that you only want to interact with 4th density Positive beings while you sleep, and that you ONLY want to spend your dream time in the 4th Density Positive realm. Declare that you intend to remember as much of your dream experiences as possible. Here is a diagram to help in your visualization process. 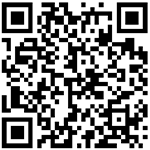 Click on the image to see a full-sized version. An important aspect to this is that if you wake up in the middle of the night, you need to re-do the process to make sure you are protected in the upper and lower levels of the planetary atmosphere or crust, which correspond to different places you can go while dreaming. The purpose of this is more than just being shielded, it’s about creating safe zones within ankle biter infested areas, and declaring that those zones are only to be inhabited by the Forces of Divine Light. It sounds complicated when it is written out, but like everything, it gets easier with practice. Practice this during the day whenever you have a spare 5 minutes, as it will keep you nicely connected and protected. When you are practicing this during the day, you don’t have to put the 3 shielding spheres around your octahedrons. Those are only for when extra protection is needed. If you have felt at any point that you have experienced negative dream state scenarios that are being projected on you, then this “safe zone” process will likely be very beneficial for you. I encourage you to work with this process and make it your own. When Will This Planet be Free? I honestly don’t have a predictive date as to when we will have this planet’s 4th density fields fully cleaned up. A lot of the barriers to this process have to do with the low-frequency energies that humans are putting out on a daily basis. This energy is ankle-biter food, so as long as there is ample energetic food for them, they will do their best to stay around, impelling people to produce more negative energy. I can tell you that 12/21/2012 won’t be the end, and I personally view it as the nascent dawning of a new era of positive energy, one that will take time to be fully integrated. Humans who aren’t ready to embody and live in a higher state of consciousness won’t be forced to do so, even though the frequency of the planet and much of humanity will be rising. However, the more people who are acting as “galactic conduits,” actively anchoring these higher frequencies into the earth, the more palpable and “real” the higher energies will be for everyone. Over time, the “offer” to ascend to a higher state of consciousness will become more attractive than living in low-frequency consciousness. When we hit that tipping point, the final clean-up and removal of the last ankle biters will come quickly. As we approach the turning of the ages, I implore you to stay balanced, grounded, and as deeply as connected as possible to your Inner/Higher/True Self, the Earth’s core and to the Galactic Core. Do your best to embody forgiveness, compassion and love, while staying strong in the face of adversity. Please do an Energy Refund daily, and take responsibility for the energy you are putting out. Every person’s consciousness matters to the whole, and the more of us who are choosing to anchor and express the highest frequencies possible, the sooner we will arrive at the point of global, positive change. Dream Shielding for a Good Night’s Sleep & More – by Cameron Day, November 29, 2012 | 2012: What's the 'real' truth? Thank you Cameron. I continue to aspire to spirit knowing that ‘when the student is ready, the teacher appears’ and am grateful to have been guided to you and your gifts. We are all gurus, students and teachers here on this planet as remarkable BEings of Light heralding in our intended way of living here. I feel blessed and honored to walk along side so many on this journey of awakening. We are the ones we’ve been waiting for and we will BE the change we wish to see. Arh also, Auro feels we’ll be free when we deal with the moon…. Looking for someone to do that research, We can support them with channeled insights to expedite things. Keep up the good work Cameron!! Thank you for this very timely post Cameron. I have been experiencing difficulty with sleep for a few months now. This makes sense to me. I truly appreciate your insight and experience with these issues. Thanks Cameron. Valuable information at this important juncture of time. Thank you for your information . So helpfull for me to understand what happen when i have been living in Tasmania . I have been light worker . I had impression somebody is very unhappy with my work and try kicks me out i didn,t sleep for long time . And it was happen I left Tasmania my husbend and my home . I didn,t give up , again doing my work in Poland with energy field. you can increase you energy by magnitising the water your dink daily. Hi Cameron. Thank you for valuable information. I have tried your shielding, and your self clearing techniques. But some how when I sit quietly down and close my eyes, a cascade of thoughts run through my head. As if I am attacked from all sides. I try to thank my ego and ask it to remain silent, but it is as if it get obsessed as soon as i close my eyes. The result is that after a meditation session I am left with no feeling of having achieved anything but holding my eyes closed for 20 minutes. It sounds more like an overly-active ego mind than direct ankle biter attack. Remember, that we have an internal opponent to overcome (ego) along with the external manifestations (ankle biters, dark sorcerers, etc). Here is my advice: Don’t worry. Just closing your eyes and focusing on your breath for 20 minutes is still beneficial. Focus your mind on connecting to your higher self, the planetary core and galactic core. After you’re connected let the thoughts come, then let them go. If a thought stands out as limiting or false, reclaim your energy from it. This makes the time productive in that you are stripping away the layers of false beliefs one at a time. If you want to experience a zero-thought inner landscape, you have to deprogram your mind from all of the false beliefs and externally programmed thought patterns you have grown up with, which takes time and consistency. Brainwave entrainment in Theta can also help you achieve that non-thought state. Even in that space, a thought can still come, but you don’t focus on it, and it will leave. See geniusbrainpower.com for more. Whoa, your reported dreams remind me of my childhood nightmares, although they do seem to have have eased off in recent years. This may sound a bit stupid and over-literal but, as a relatively poor visualiser, I do have an orientation problem with the suggested shields and the connections from galactic to earth cores. For instance, the shielding protocol describes a set-up in the upright or standing position, whereas when you are lying down, your head and feet are not in a straight alignment with the earth’s core and the galactic core – they are at more of a right angle. Should I just visualise the shields as being above and below my chest and back (rather than head and feet) or should I think of the energy connection sort of bending up and down from my head or feet towards the two cores. This is a good question. What I do is keep the shields oriented straight up and down, and keep the galactic and earth energies going vertically into and through the center of my body. In other words, everything keeps moving the same, even if my body is in a different position. It’s just going into my heart first instead of my head. Where have I been? Where is this blue places? I’ve been asking my higher self to guide to me the truth and lo and behold, I stumbled upon your website last night and have been reading/viewing/listening almost nonstop since then. I’ve finally found something that resonates with me and also provides tools for us to help ourselves and not create further dependencies. My issue is dark entity/parasite that I picked up about three years ago while working with a so-called healer and it’s created a torturous situation especially over the last year. I’ve gone through a powerful psychic, a shaman, another healer and a medium to try to remove it, but finally found an alternative healer who is removing the tentacles manually so to speak. I love the concept of sovereignty and started using your clearing to empower and strengthen me as I will no longer allow myself to be enslaved by anyone or anything. The entity blocked my ability to “see” any light (or visualize anything) with my eyes closed and has interfered with my endocrine system affecting my physical energy. It also affects my sleep, imposing dark, ugly dreams (which at one point were actually dreams from hell, literally). I will begin using your protection process immediately. Thank you so much for sharing these tools. I mean you won’t die I’ve eaten before long ago and i’m alive and well thanks Just that now because I’ve revoked a lot of agreements constantly I have dreams where food is just all over the place so when I woke up I instantly think of throwing up all the food. Just saying I recently became aware of this, but I mean if that’s the worst you remember from a dream you’re fine or even when you dream really awful stuff it’s not really life or death.